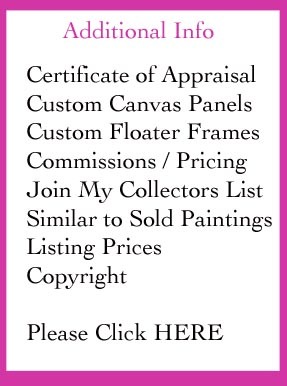 Read about my inspiration for this painting as you go through this post. "Today and yesterday I drew two figures of an old man with his elbows on his knees and his head in his hands. I did it of Schuitemaker once and always kept the drawing, because I wanted to do it better another time. Perhaps I’ll also do a lithograph of it. What a fine sight an old working man makes, in his patched bombazine suit with his bald head." I always loved this painting but I found it to be so sad so never used it in my work. After reading about van Gogh's doubts with his faith I decided to change the old man into van Gogh. 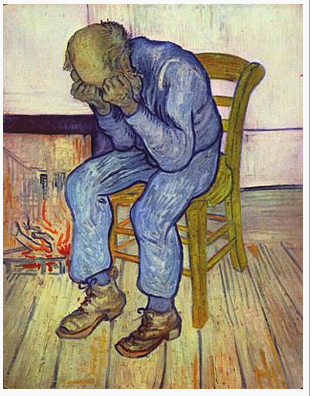 When Van Gogh was younger, he was thinking about dedicating his life to those living in poverty through evangelization. 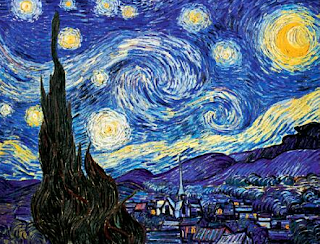 This religious undertaking helped him to create the Starry Night painting that everyone knows today. He was in an asylum in 1889 when he painted the image of the night sky with stars sparkling in the moonlight. Count the stars and there will be 11 of them. 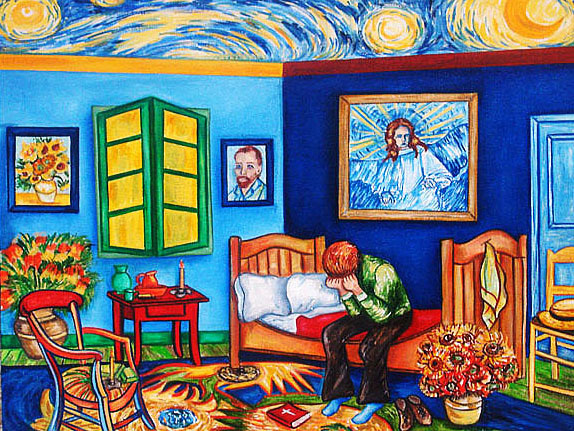 Then I pictured Vincent sitting on his bed praying deeply under the sky of his Starry Starry Night painting. I found this beautiful painting that Vincent painted after Rembrandt's Head of an Angel and pictured it hanging on the wall behind him protecting him and blessing him in hopes of restoring Vincent's faith. …and that is the inspiration for this painting about Vincent. “The Angel (After Rembrandt)” is also known as “Head of an Angel (After Rembrandt)” and “Half Figure of an Angel (After Rembrandt).” It’s an oil painting that looks more like watercolors than oils completed in September 1899, less than a year before Vincent Van Gogh would die of a gunshot wound. Rembrandt (1606–1669) painted many angels in his legendary career as well as other religious scenes. Van Gogh would copy numerous Rembrandt's, especially those featuring angels. This particular painting is done mainly in shades of blue with a yellow halo. These shades and streaks of yellow can be seen in Van Gogh’s famous painting “The Starry Night.” The angel’s downcast face is in pale skin tones, making the face pop out from the rest of the painting. The angel is pretty but is not looking at the viewer. One arm is outstretched to the viewer, but the palm is tightly closed. The angel seems at once to be revelatory and yet still retains his secrets, almost teasing the viewer with his closed eyes, seraphic smile and closed hand. 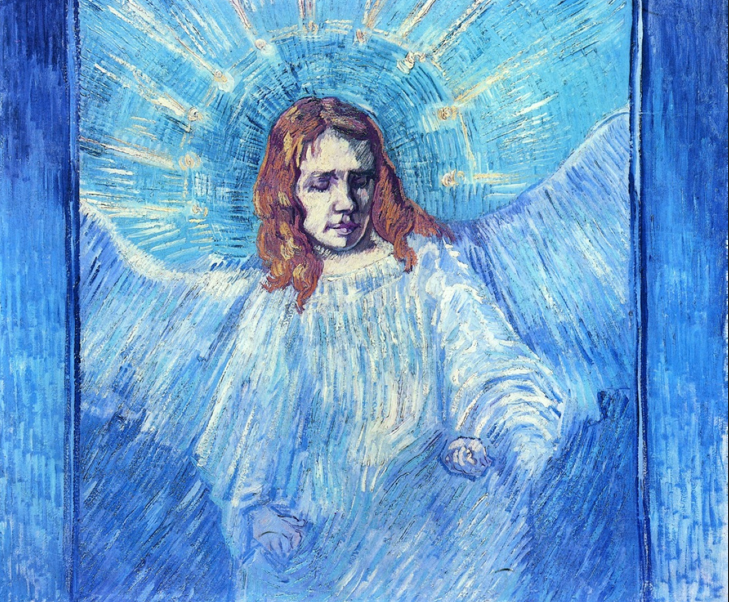 The angel mirrors Van Gogh’s own dilemma with Christianity. Van Gogh was a minister in an impoverished mining community in Belgium when he was struck by the desire to create. His superiors removed him from the ministry because he looked and acted more like one of the miners than a minister. He was sent home in disgrace. It also during this time that Van Gogh doubted the same beliefs that he was preaching. Why would a loving God allow such suffering? Van Gogh wrestled with Christianity the way that Jacob wrestled with the Angel – another Biblical scene Rembrandt painted but Van Gogh declined to copy. The angel in that painting has his eye half-opened and looks on Jacob with pity. Van Gogh’s angel looks very much like this angel, but does not show pity.